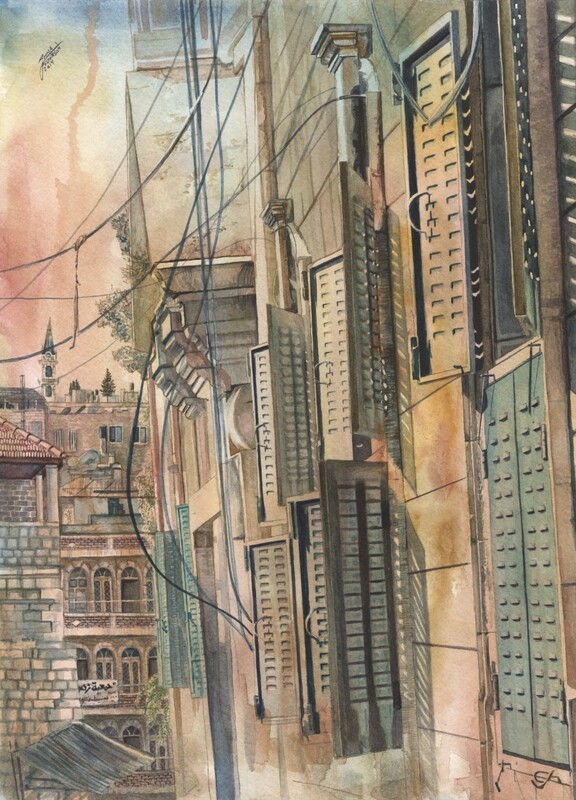 Size & Medium: Watercolor 16" x 20"
Details: Walking through the Old City in Jerusalem can be very overwhelming; the streets are very narrow, there are tall buildings on every side, there are people walking swiftly through the tangled streets, kids playing, and tourists taking pictures (like me).There are different kinds of buildings, both new and old. It is a huge contrast to my city in Canada. All the buildings in my neighborhood look exactly the same and we have so much space between the houses. It is quiet and peaceful, and everybody minds their own business. In Jerusalem, I found, there were always things going on, people selling things, calls to prayer over the loud speakers, and tour guides shouting to their groups. I couldn’t put it all in my painting. I used a pouring method to start this watercolour. It was the first time I had done this, and I was intrigues by the effect. My painting was richer than my previous ones had been. There was uncontrolled colours mixing together, and spots of interest I hadn’t anticipated. I just loved the way the colours came to life. I kept adding layers upon layers, waiting for the paint to dry in between. Then I added detail; bricks, shingles, the clock face in the tower, the Arabic on a sign, the window panes, and so on. I painted it down to the wire, I guess you could say! I just painted one tiny section of Jerusalem to represent the chaos of this historical little city.